"Eat only what you need -- destroy the rest." He has two mouths to feed -- his own -- and spends most of his time doing it. Since his mouth is usually full, his orders are usually misinterpreted. Prefers eating non-living to living things... doesn't like anything that might still be wriggling about after he swallows it. Can refashion digested materials and spit them out as crude missiles. Has powerful sonic stun gun in robot mode. Combines with fellow Terrorcons to form Abominus. "Autobots are an error I intend to correct." Any organic creature whose status on the evolutionary scale ranks higher than a slime mold, particularly Autobots, sends him into a ferocoius frenzy. Hates the smell of carbon-based life forms. In creature mode, claws and teeth can slice through almost any substance. Has twin, ground-to-air, voice-guided missile launchers. In robot mode, has cyclone gun. Combines with fellow Terrorcons to form Abominus. Not a trace of mercy can be found among his microchips. Insatiable lust for destruction. In battle, lashes out with wings, beak, and claws to cut everything to ribbons. In creature mode can leap 4 miles in one jump, breathes flame. In robot mode, carries double-barreled magnetizer that oppositely charges any metal target so it tears itself apart. Combines with fellow Terrorcons to form Abominus. "The sound of ripping metal is music to my audio modules." Prowls the perimiter of the Terrorcons' lair looking for trouble -- and hoping to find it! Then he can show off his razor-sharp teeth, piercing pronghorns, and steel-shredding claws. Has flame cannon and flame breath in creature mode, armor-piercing rocket-grenade launcher in robot mode. Combines with fellow Terrorcons to form Abominus. Unnerved by small creatures like mice, insects, and mini-droids. 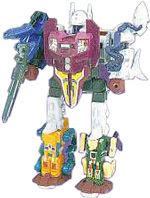 Abominus transforms into the five Terrorcons. Has overwhelming destructive power. Likes attacking large or moving objects, climbing tall buildings, and sinking ships. Has no heart / soul and is nothing more than a killing machine. Abominus carries a sonic concussion blaster. The most disgusting of all Transformers. Wherever he goes, he leaves a trail of foul-smelling lubricant which is oozing out of several different joints at any given moment. Dumb, brutish, but loyal. In creature mode, claws allow him to climb any wall. Breathes fire. In robot or creature modes, uses slime gun to shoot stream of corrosive liquid. Combines with fellow Terrorcons to form Abominus.